You are cordially invited to participate in the West Tennessee School for the Deaf's 15th Annual Golf Tournament. This year our tournament is scheduled for Friday, May 17th, 2019 at the Jackson National Golf Club. Our sponsorship campaign is currently underway! We offer a variety of contribution levels, allowing both businesses and individuals an opportunity to support WTSD. All sponsors will be acknowledged on WTSD's Annual Golf Tournament Sponsorship web page as well as on our Facebook event page. Throughout the years, our golf tournaments have collectively raised more than $75,000. Your tax-deductible donation will make a definite and immediate impact. 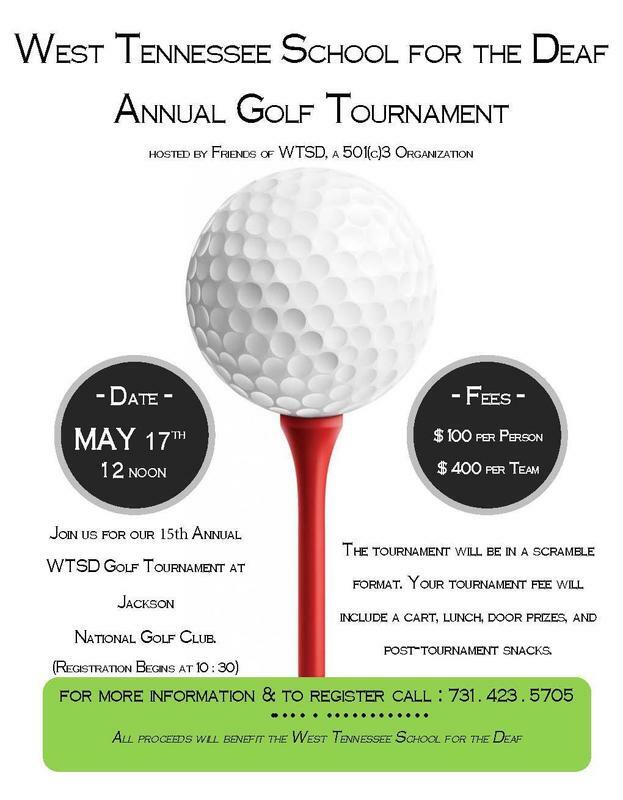 If you have any questions relating to our golf tournament, please feel free to email info@wtsd.tn.org or call the school at 731-423-5705. Our students, their parents, educators, and organization members thank you in advance for your consideration and hope that we can count on your continued support for the 2019 tournament!